I've known for years someday I would cross the visible tattoo threshold and put a design on my forearm. More recently, I've been leaning toward a food-centered design that would support my passion for the vegetable kingdom. Well, the blessed day finally came a week and a half ago, when I got these little beauties. Beets, my friends, beets! Aren't they lovely? I am a huge fan of black tattoos and greywork, so I'm not getting any color added. I love my design and delicate yet bold effect of the black ink. The skin is still peeling and the area is still a little red and inflamed, but overall it is healing beautifully and looking great. I acknowledge that may seem strange for someone that is dedicated to non-toxic living (namely, me) to get themselves voluntarily assaulted with a needle and ink. But despite my sensitivity to oh-so-many things in this world, tattoo ink and I seem to get along just fine. The tattoo process doesn't mess up my qi significantly and the skin heals well. So I say, bring on the ink and let's get to business. I'm happy to now have the earth (my newly acquired root veggies) and the sky (a flock of birds on my ribcage) represented on my body. What tattoo will be next, I wonder? 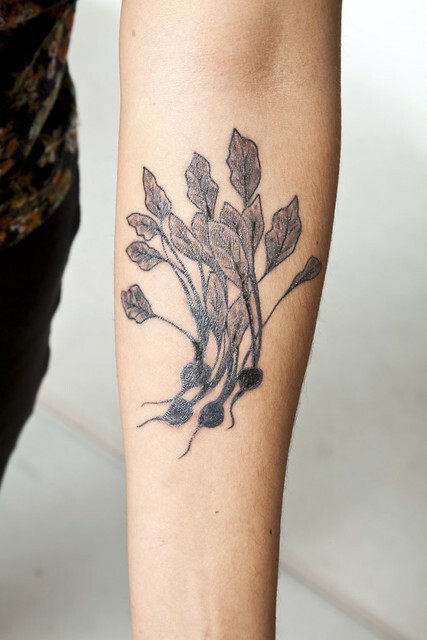 Do you have any food tattoos? Older PostRecipe: Who needs potatoes when you have Parsnip Apple Mash?